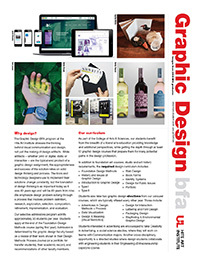 The Graphic Design BFA track is a professional preparatory program leading to the Bachelor of Fine Arts degree. It is intended to prepare students to eventually assume leadership positions in the field of graphic design. The graphic design program at the Hite Art Institute focuses on three aspects: conceptual development, compositional eloquence, and technical proficiency. These aims are accomplished through both hand and computer-based work. The Bachelor of Fine Arts (BFA) degree is primarily intended for professionally oriented students. Admission is selective and enrollments are limited. We typically accept a maximum of 22 students a year into the BFA program. Presently accepted majors for the BA in studio art who have completed or are currently completing the 100-level foundations courses (ART 105, 106, 107), plus have completed or are currently enrolled in ART 205 Foundation Design Methods (offered in Spring semester only), have a combined minimum GPA in art and art history classes of 3.0, and a minimum overall GPA of 2.5 are eligible to apply for the BFA program by completing a BFA Application in the Department of Fine Arts. BFA Applications for Graphic Design are reviewed once yearly in April. Majors also take two additional 500-level electives in graphic design; one additional 300-level studio art course; and one additional 300-level or above studio art or art history elective (which may also be an additional graphic design elective). Graphic Design courses are only open to students admitted to the BFA program in Graphic Design. Although an internship is not a requirement of the major, almost all graphic design students complete one or more semesters of internship experience. During the fall and spring semesters, full-time students participating in internships generally work from 8 to 10 hours per week (or approximately 120 hours during the semester); students are able to spend more hours per week in summer internships. Part-time students may be able to work more hours per week in an internship, on a case-by-case basis. For organizations seeking graphic design interns, view our Internship Program Information. If your position qualifies as an internship, contact Leslie Friesen to have your internship request posted for students. For requests that do not qualify as internships, we will also post information about freelance assignments or pro bono design requests from 501(c)3 non-profit organizations. View our Request for Student Design Work, or contact Leslie Friesen for additional information. Once admitted to the BFA program, students are expected to work closely with their mentor towards completion of the degree. All candidates must maintain an overall GPA of 2.2 or above and a departmental GPA of 3.00 or above to remain in the BFA program once accepted. Graphic Design candidates must meet with their mentor each semester to ensure they are performing adequately and following the proper class sequence. In addition to completing the curricular requirements, BFA candidates must also pass their program's capstone requirement, part of the Department's Learning Outcome Measurement. The Graphic Design capstone consists of the students' successful completion of the Professional Development course and presentation of a portfolio of work to professionals in the field during the Portfolio Day event. Request a visit: If you are a high school student, transfer or returning student, or UofL student considering changing majors, email us to request more information or to schedule a visit.